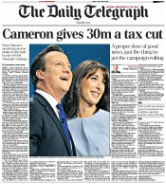 Thursday 2 October, 2014 For once, Cameron got exactly the headlines he wanted this morning: tax cuts for 30m people. This was his reward for a confident - even "fizzing" speech - to round off the Conservative conference. Vote for him next year and by 2020, people earning £50,000 a year would not have to pay higher-rate tax; people on the minimum wage who worked 30 hours a week would pay no tax at all. Zero, zilch. The promise would, we were told, cost £7.2bn to implement. But we were not told where that £7.2bn would come from. Much play was made today of that gap in the rhetoric - Ed Balls threw back at the Prime Minister his own remark that a promise was worthless unless it was accompanied by details of how it would be financed. Meanwhile, estimates of the benefit of the tax band changes ranged from £160 to £2,167. The Government itself said that someone on £50,000 a year would be £1,313 to the good. 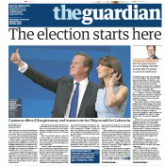 Journalists are not known for their numeracy, so most papers didn't attempt to analyse the figures. The Independent and the Times went so far as to ask City experts to run them through a calculator, but that was about as far as it went. 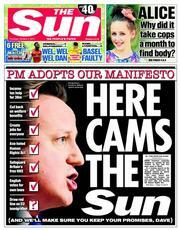 For the most part, coverage was mood music - and a very good mood the Sun, Express, Telegraph and Mail were in, too. 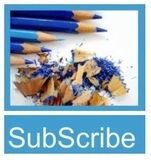 There are no mathemeticians at SubScribe, either. But it seemed worth grabbing an envelope, pencil and a compound interest calculator to see what we could discover. Just like in our O levels, we are going to try to show our workings - if only so that those with greater numerical felicity can point out the errors along the way. The first problem we encounter is George Osborne's freeze on benefits - in this case we are concerned with working and child tax credits. The two-year freeze is to follow a 1% increase, so it should take us through to 2018, more than halfway through the next Parliament. To complicate things futher, a universal benefits/credits system is being piloted in some parts of the country. So please bear with us. When the coalition came to power in 2010, the minimum wage for people aged 21 and over stood at £5.93. To make things simpler, we'll round that up to £6. The personal allowance for income tax was £6,475 and the threshold for higher rate tax £37,400 (just £100 less than Cameron's target for 2020). That meant you didn't start paying income tax at 40% until your earnings hit £43,845. National Insurance contributions were payable on pre-tax income over £5,720. This was levied at 11% until your earnings reached £43,888, at which point you had to pay another £80.74 + 1%. The personal allowance for income tax is £10,000 and the threshold for higher-rate tax £31,865, so that the 40% rate clicks in when incomes hit £41,865. National insurance contributions are charged at the rate of 12% for incomes between £7,956 and £41,865, and at 2% above that level. Looking ahead to the end of the next Parliament is tricky. 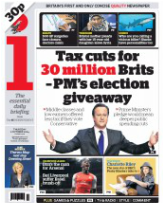 We don't know what will happen to the tax credit regime or to National Insurance. Nor do we know where the minimum wage will be set. Ed Miliband has promised to take it up to £8, and it seems fair to assume that the Tories won't match that. 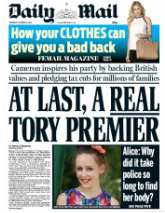 Cameron has spoken of "working towards" £7. Combining his promises that no one working 30 hours on the minimum would pay tax and the thresholds of £12,500/£37,500, he appears to be giving himself enough leeway should the minimum reach the Miliband level. So for the sake of argument, we'll be generous and assume a rate of £8. The ceiling for 12% NI payments is in line with the 40% tax threshold, but the allowance before contributions become payable is smaller. If the ceiling were to retain its link with the higher tax band, payments would need to start at around £8,000 in order to give the £50k earner the £1,313 benefit cited by the Government. The personal allowance for income tax is £12,500 and the 40% threshold £37,500, which means the higher rate kicks in at incomes of £50,000. 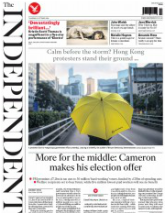 National insurance is levied at 12% on incomes between £8,000 and £50,000. That all seems fine and dandy. But there are a couple of pointers to remember. The low-pay couple's income in these examples is based on the assumption that the minimum wage will rise by at least 50p over the next six years; there is no guarantee that will happen. The CPI does not take housing costs into account, and while home-buyers have enjoyed record low mortgage rates, rents have been rising. And there's another element that comes into play with all this: inflation. The inflation rate for 2010 was 3.3%, for 2011 4.5%, for 2012 2.8% and for last year 2.5%. It is running at about 2% this year. If the personal allowance and tax thresholds had risen in line with inflation over the period of the coalition government, the basic allowance would now be £7,605 and the higher-rate threshold £42,539. 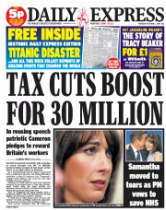 That means you would already have to earn £50,144 to have to pay the 40p tax. 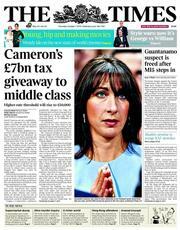 But the fact that the personal allowance has far outstripped inflation is obviously better news for the lower-paid. As it is, the family on the minimum wage when the coalition came to power have pretty much kept pace with the cost of living over the past five years. Their 2010 income would be worth £19,332 today, slightly less than their present total. But looking to the future, the £21,023 they can expect in 2020 (if inflation stays constant at 2%) will be worth only £18,667 in today's money. If the rate went up to £8 an hour they'd be about £600 better off than today in real terms. As for our middle manager, the £35,808 he or she was taking home at the end of 2010 would have had the buying power of £40,215 today. And if inflation remains constant at 2% to the end of the next parliament, their expected £37,460 will be worth only £33,263 in today's money. Suddenly nobody looks better off. This entire enterprise was malicious and misconceived, and has resulted in women losing a valuable voice in government. Newmark founded Women2Win with Baroness Jenkin in 2005. That's nine years of campaigning to help women advance in the macho world of Westminster. Did the Mirror's freelancer think that Newmark was in it only to find young blondes willing to take their clothes off?